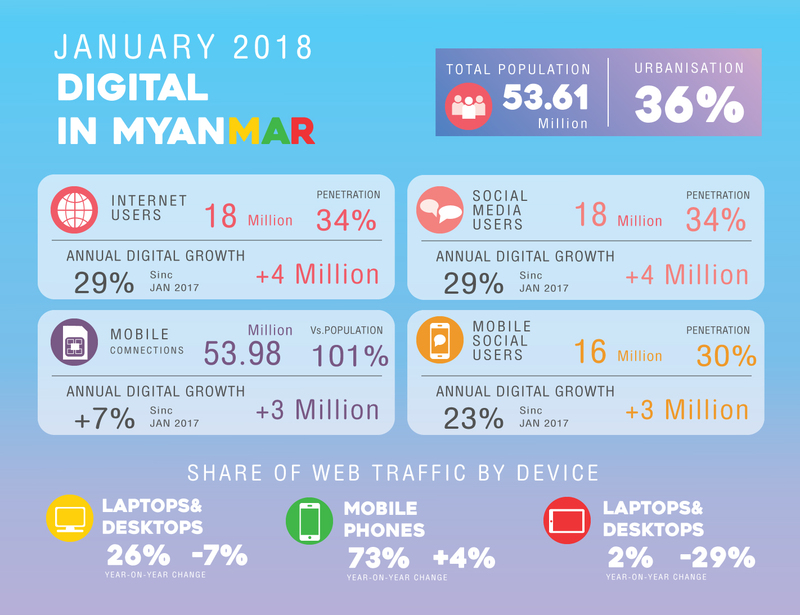 Does Digital Marketing work on Myanmar consumers? Telecommunication growing tremendously in recent year. Many Myanmar users have also leaped straight into mobile Internet services at an earlier stage of development in the telecommunications sector as compared to their counterparts in the region. The population of 53.61 million people, about 98% access mobile sim cards. 18 million people can access the internet and all of them are on social media. The increasing numbers of accessibility to internet and social media open more opportunity to not only users but also the retailers and marketers to reach more consumer. The social media platforms and commercial sites, highlighting an excellent opportunity to reach their targeted consumers directly and promote their products. Undoubtedly, Facebook is one of the most powerful media in Myanmar. Social media platform allows you to collect data and sent different types of messages to your targets based on their interest. You can segment the same group of people who have seen the first awareness-raising message and target their location then learn about their consuming behavior. After that, you can also target a secondary group to learn about their influencers or loved ones and test the traffic. With all those good qualities of social media, it is still not enough to influence the targeted the consumer’s thought because of the consumer’s cultural perspective. Culturally elders and people with high social status (teacher, doctors, monks and etc.) have the power to influence younger members to listen and follow them. The same concept goes to marketing, Myanmar consumers tend to listen from authoritative figures, experts, public figures and other experienced consumers. For an instance, an advertisement with doctor recommendations most likely to get trust from more consumers. Even though Myanmar culture is more oriented feminism, men are still household and decision makers. The gentle touch on caring and quality of life in marketing is the common way to touch Myanmar consumers’ heart. One of the undeniable channels of reach consumers’ ears is word of mouth. Myanmar word of mouth is the most trusted channel of information for the consumer because of the culture context where personal relationships are essential for doing business. Consumer, most of the time, know about the products from friends, colleagues and relatives through word of mouth which has a significant role in influencing the purchasing decision. Moreover, the good review from public figures would boost the product awareness among the consumers better. Direct marketing channels including events and in-store promotions such as discounts, lucky draws and gifts, are also becoming popular amongst Myanmar consumers because it allows people to see and test the quality of the products. It is also another good opportunity for gaining good reviews and boost the word of mouth effect among Myanmar consumers. From on ground marketing activity, companies can learn more about the targeted consumer and influence the perception consumers by showing and letting consumers test the quality. The bonus point of direct marketing in Myanmar is to get to know about the diversity of culture among consumers and have an opportunity to localized the products based on different culture. In Myanmar, traditional mass media like TV and billboard still play a big role in reaching the variety of consumers they spend an extensive amount of time in front of TVs and in traffic, especially in urban cities. Currently, there are 7 television channels. TVC’s advertisements show average around 14 minutes across all the channels, lower than international rate. TVC and print advertising are the leading media landscapes, representing 63% and 32% of total marketing activities. Top product categories spending on advertising; pharmaceuticals, beverages, cosmetics and personal cares. For the print media and radio have decrease their popularity in urban areas but they are still effective in reaching the rural population. In conclusion, digital marketing is the best choice to reach vest amount of people and flexible enough to change the tone of the products based on the targets. Even they can reach digital media users which is only 18 million mainly from the metro and urban area. However, to change the perception of consumers on products and change their purchasing behavior, companies need to think more about adapting to the culture of Myanmar consumers and reach their heart by using different marketing strategies. Happio Myanmar Co., Ltd provides creative and digital solutions, marketing, consulting from Online to offline activity, to help organizations and individuals create the value they’re looking for in both Thailand and Myanmar. Happio believes in Open Communication, Co-creation and Continuous Improvement. Happio is family of Index creative village and core DNA is “creative” While Specializing in “online & Digital” Our Team Consist of Marketer, Designer and Developer. Tell us what matters to you and find out more by visiting us at http://www.happioteam.com/. Din, Y. (2018). Digital marketing 101 (in Myanmar). [online] Frontier Myanmar. Available at: https://frontiermyanmar.net/en/digital-marketing-101-in-myanmar].